Welcome to this weeks rides, as usual there are two on offer starting from the Rose and Crown. Our first ride can only be compared to the three peaks challenge, except that there is no walking, or transport arranged between peaks. Oh, and there might be more or less than 3 peaks, and they won’t be so high. Otherwise the long ride is very similar. This route exhilerates for almost 24 miles leaving, little time to appreciate the wild flowers at the side of the road. Surely another challenge too far for Jack! And now for the short ride, aka the twin peaks challenge, again remarkably not similar to anything by a similar name. This route meanders for a gentle 13 miles, through some of the most dramatic and breathtaking British countryside. Be sure to take it gently so as not to miss anything! As ever fabulous weather has been arranged. Please take a look at our new local forecast. And on our return, the Rose and Crown is pleased to announce the addition of Bacon Rolls to its menu. Remember this is valuable source of carbs and should be consumed in the “golden hour”. And one more matter before you all nod off reading this dribble, don’t forget to let Dave know if you will be attending any of the visiting mechanic sessions, so that numbers can be concluded. Great turn out on Sunday with 12 ‘velos’ out and thanks to the Robin Hood for the excellent organisation and a fun ride, it was also reported that one of the team completed the 15 mile circuit in a fanstastic 38 minutes, anyone owning up? Thanks also to the Tring Lions for marshalling the ride who helped to make it a ROARING success! Well done also to Rich Parsons for completing his Waddesdon 100 mile challenge in just over 6 hours! Dave Bembridge has provisionally arranged for Sam from MBRS UK Ltd our local mobile bike mechanic to give basic mechanics training at the Rose and Crown. This is a 2 hour session 10-12 and then 1-3 the cost of this session is a very reasonable £15 per person. Sam is highly recommended by a number of the group, including Andrew, and his credentials are well noted on his website. For those wanting to take part please either speak to Dave or send your interest through this site by Sunday 26th September. Good luck to Hannah Beezer ( a true cyclist unlike her ‘baby’ brother?) returning for her final year at Sheffield Uni! 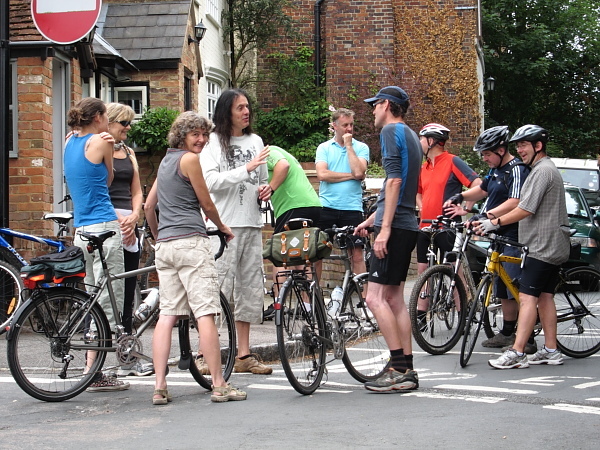 On Saturday Dave Bembridge will be leading out an 8 mile ride starting from the Rose & Crown leaving at 11:30, this is a great opportunity for those of you who are, or know of people, nervous of joining the Sunday rides and lycra is definitely NOT required! We are looking to join the Robin Hood Pub‘s Annual Charity Bike Ride. This aims to raise funds for, Tring based Iain Rennie Hospice at Home (IRHH). 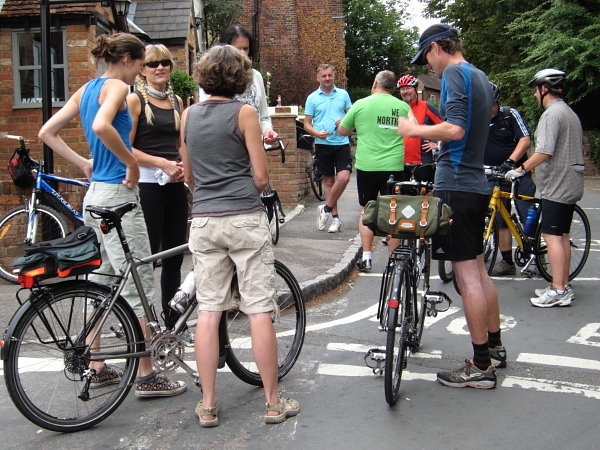 Refreshments will be offered along the way as entrants pedal their way from Tring along a testing 15.5-mile route through Wigginton, Cholesbury, and St Leonards. It then continues through Wendover Woods, Aston Clinton and along The Lower Icknield Way. In its fourth year, the annual ride has so far raised more than £5500 for the hospice. We will leave as normal at 10:00am on Sunday from the R&C as a group anyone wishing to do the short route will then carry on as those doing the long route stop to register at the Robin Hood. Once we arrive back at the Robin Hood we can ‘re-group’, maybe have a quick ‘sherbert’ before returning to the R&C the same way we came. Registration for the Robin Hood Ride is £2 per person and we are suggesting we each pay £5 to help the fundraising, of course anyone wanting to donate more is more than welcome! This money will be paid individually when we first arrive at the Robin Hood. Here’s to a great weekend in the saddle!! Last weekend saw several members of the Vinghoe Velos take on their supreme challenges with many gaining honours for their efforts. These included a number of successes at the highly prestigious Ivinghoe Flower and Vegetable Show held on Saturday. Amongst the honours there was First places for, Angela Hollands, Lucy Ashton, the Beezers (they can fight over who were the true winners!) and several second and third places with the Hetherington Cherry Tomatoes getting a second place! Steeped in their ‘glory’ Jose and Andrew headed off to Bath to take on the Wessex 100 (miles!) on Sunday. Whoever says the Salisbury Plain is flat wants to think again! Facing continual head winds (how can that be possible when you are doing a circular ride?!) and a severely undulating route sadly Andrew was forced to retire in a ‘messy heap’ after 75 miles whilst Jose went on to complete the ride, a tremendous effort!! This weekend sees the Vinghoe Velos joining the Robin Hood Charity Ride in Tring on Sunday leaving the R&C as usual at 10:00 on Sunday, Dave Bembridge will be leading out a short ride on Saturday. Final details for both of these rides will be published on Thursday. Please find below somewhat late in the day this weekends rides. As usual start at 10.00 from the R&C. For those wanting their first ride or a short route Dave Bembridge is doing a ride out from about 11.30 on saturday. Approx 7 miles.